Can you believe that what started in 1940 as a tiny little barbecue restaurant in California, is today one of the largest restaurant chains in the entire world? And now you can buy a McDonald’s gift card at a discounted price and save money on all your favorite Mickey D’s items! Breakfast, lunch, dinner— and anytime in between, you’ll get more food for less! What’s more, with over 14,000 United States locations, you’ll have no problem putting your discounted card to use! Finally, eating the foods you love doesn’t have to cost you an arm and a leg! Whether you’re a Big Mac fan or just want to cool off with an ice cold McCafe, this is the perfect way to save money! And that’s not all. Gift cards are a form of currency, so you can use your card time and time again, for as long as a balance remains. So why wait a minute longer? Buy a McDonald’s gift card today and start saving money on one of the world’s most loved fast food restaurants! And we aren’t just talking about succulent beef burgers here! Their menu offers chicken strips, chicken sandwiches, salads, fries and much more! Why, they even have hot fudge sundaes, baked apple pies, and other sweet treats, for anyone who just wants a fast, satisfying dessert. 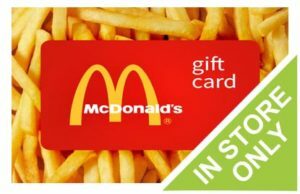 Purchase your discounted McDonald’s gift card today and use it anytime on the same fantastic fast food! From Happy Meals to the ever-famous Egg McMuffin sandwich, your discounted McDonald’s gift card will save you money! But don’t forget- gift cards are excellent presents too! Surprise that special someone in your life with the gift that just keeps on giving! And be sure to check out the other great discounted gift cards Cards2Cash offers. Everything from retail stores to websites! You can save money on food from Burger King, Wendy’s, Hardee’s, Arby’s, and more! With Cards2Cash on your side, saving money on fast food is easy! Do you have a McDonald’s gift card you aren’t going to use? Maybe you’ve sworn off the golden arches, and would like to have money instead? If so, then I have excellent news! Cards2Cash buys lots of gift cards! What’s more, we pay top dollar for them! If you are interested in selling a gift card, stop in one of our retail locations, and we will give you money on-the-spot for your unwanted card, OR fill out our online form, and we’ll get back to you with an offer! Cards2Cash is your gift card connection!